CAB award goes to CM ? CAB date with RS on Feb 12 ? CAB & scoring 21 out of 25? Protective Thinking: Can NRC Update save Assam and Northeast Region ? Indigenous street vendor sing gi wafam loisindana..
Influx-weary Manipur, a destination for immigrants? Fruit stalls on a public foot path : Who gave them the license ? It is the valley that needs protection : Why not a Bill only for valley ? All eyes on Govt ahead of fresh Bill : Why not a Bill only for valley ? Testing time for Govt, people : More stormy days ahead ? Public Dialogue on "Protection of Indigenous People of Manipur"
Hasty decision by the government ? Dress Code For Protestors / Bandh Agitators!!! Is Modi making Manipur Assembly's ILP as anti-Indian Constitution and for militia ... ? Is election euphoria killing the ILPS agitation? 'The catastrophe' : What is wrong with ILPS? Two diametrically opposing stand Will Delhi give the assent ? Are Manipur's 3 bills with Rashtrapati Bhavan or PMO? Public curfew, torch rallies, road blocks : Reliving the days of 2015 ? 42 hours Statewide bandh : Stormy days ahead ? Can Narendra Modi honour Manipur by accepting ILP and removing AFSPA before 2017? Time for debate, dialogue and negotiation? The LLTT influence and Manipur Problems! Are Tribals of Manipur ready for a separate UT or State? Anti-bill Agitation: A Hidden Agenda ? Can the State Ever Succeed in Bridging the Hill-Valley Divide? PHOTO : Public meeting at CCpur public ground and Sit-in Protest across CCpur :: September 4 2015. Unannounced bandh : Self-propelled movement? Manipur Police - A threat to democracy? ILP - Totally an Adult Issue? PHOTO: Protest rally by students at Andro Parking , Konung mamang :: July 06 2015 . Dr. Khomdon Lisam - 2 part series on MRVT&MW Bill 2015. Samarjit Kambam- ' The simplest illustration of MRV&T Bill is like a marriage without a bride' . Why recommend Manipur Regulation of Visitors, Tenants and Migrant Workers Bill-2015 without penal provisions? Dr. Khomdon Lisam - 2 part series on ILP system. How can we salvage the Manipur State Legislative Assembly ? ILP to become Ibobi's Waterloo ? Is Suspension of ILP the right thing to do? Shall we demand inclusion of Meitei : In Schedule of Tribes first for ILP System ? Will illegal migrants outnumber northeast indigenous people in 30 years? Meitei ST (Scheduled Tribe) is the only key to ILP in Manipur. Why? Influx: An expedition for silent, bloodless conquest ? ILP Or No ILP ? 'Think Of The Nation' ? 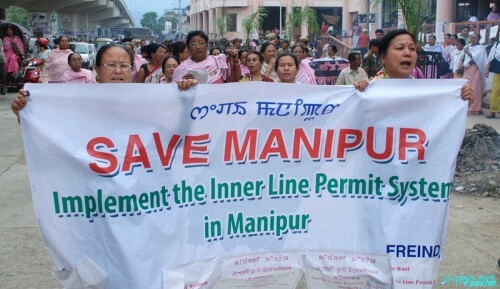 Why does Manipur require Inner Line Permit System ? Has India's response to cross-border migration been effective ? Have we arrived, finally ? Why the wait for ILP ?